The Omnivore's Dilemma revealed the dark underbelly of our modern food industry and discussed the ethics of it all; In Defense of Food talks specifically about the rise of "nutritionism", nutrition, and also how to start eating well and healthy again. The book was interesting enough, but a lot of it was old news to me, and it wasn't as thought out or as in depth as The Omnivore's Dilemma. Pollan also discusses in depth the lipid phobia that seized the country in the second half of the 20th century. It's always a mistake to demonize one macronutrient and glorify another; on a low-fat diet, Americans have gotten fatter. Of course, I already knew much of this, but what was interesting to me was that the evidence that saturated fat actually increase chances of heart disease is quite sketchy. After all, it could be that diets high in saturated fat don't have as many vegetables and fruits, and that nutrients there keep the heart healthy. Or it could be due to entirely other factors. Something that was fairly new to me was the whole general concept of "nutritionism": focusing on nutrients rather than food. Because frankly, there are so many factors to nutrition that it's nearly impossible to just break it down to nutrients and vitamins and minerals; there might be something else we're entirely overlooking. Pollan talks about the shift from talking about food to talking about nutrients in government policy; you see, food has lobbies and powerful interests. Nutrients do not. This was an area I didn't know much about, and was probably the most interesting part of the book. As was the history of flawed studies and misinformation that has plagued government healthy policy. The thing was, Pollan spends all this time talking about how little is known about what's good and bad for you, and how it's a mistake to look too much at nutrients, but then he does pretty much the same thing in the second part of the book, praising omega-3's benefits and so on. Now I'm sure it's true that omega-3 fatty acids are needed (it's just common sense), but it seemed rather hypocritical to me. He does acknowledge that he's doing what he just criticized, but I still found it annoying. 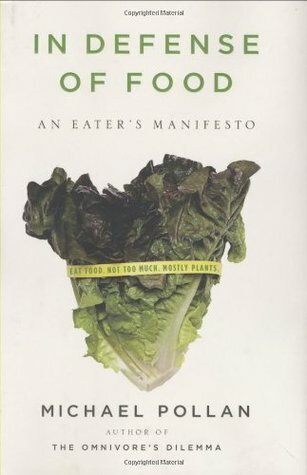 At any rate, The Omnivore's Dilemma is the much better, more sophisticated and thoughtful book, but In Defense of Food was a quick overview of the history of modern nutrition, our current issues, and what to do about them.